My Goodness, what a grand turnout for our 4th annual End of Summer ShowOff Car/Truck/Bike Show! Once again, we would like to Thank everyone that supported this community auto event. We are truly honored and cannot express enough how grateful we are, and how beautiful the vehicles were! We had a fabulous time putting this event on. TOCC designs & presents these community automotive events for you, and we hope you enjoyed the show. We worked very hard to ensure a well planned, professional event and we could not have done it without you and the collective efforts of many! Please let us know any thoughts that could improve our future community automotive events. 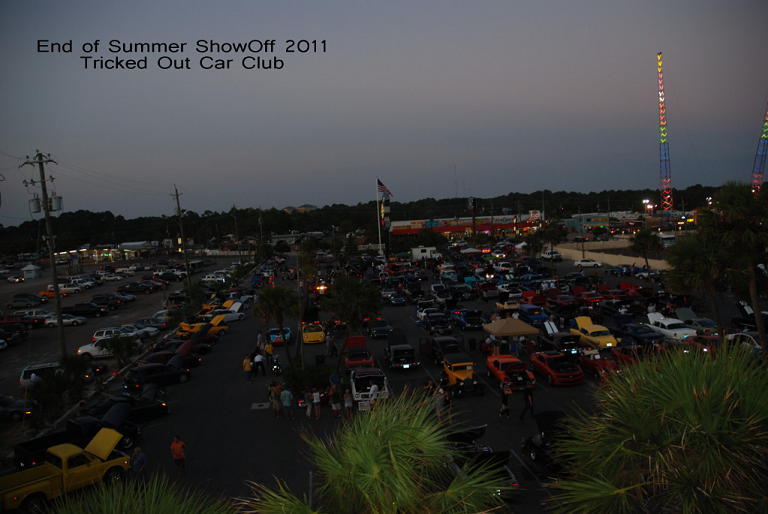 From our community partners, to the many car, truck & bike clubs present, to TOCC's very own... EOSS 2011 landed on Panama City Beach by force. If you were not present, you sure missed a fun time and we hope you will make plans to attend next year, Late September, on a breezy Saturday Night in 2012. Stay tuned for more info on that as much has been completed already for it! TOCC is always tweaking our shows, so one thing is certain... 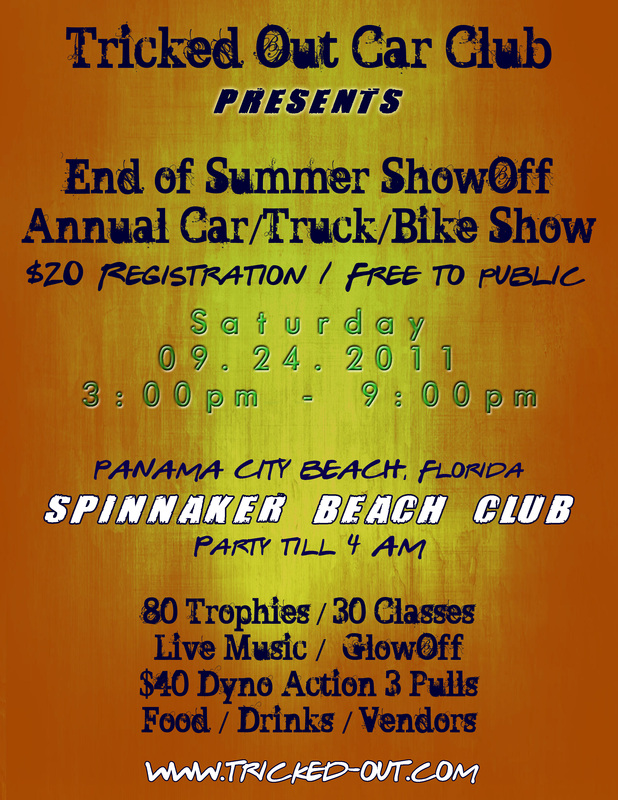 The 5th Annual End of Summer ShowOff by Tricked Out Car Club will be even bigger & better for 2012. 181 Show Cars, Trucks & Bikes present. 1400+ People through the gates. Handed Out $2100.00 in Cash & Goodies. DynoJet Dyno on the scene. Wheelie Poppin' Bike Ride on the scene. Raised $1425.00 for Local Charities - See below and our TOCC Giveback Page. Event Timeline: 2:30pm - 12:30am. 24 Car, Truck & Bike Clubs Present - See list below. Many, many enthusiasts/independents from throughout the Southeast United States. Anchorage Children's Home - $1025.00 + Additional Domino's Pizza donation from EOSS. We want to extend a big THANK YOU in advance to the following car clubs for attending EOSS 2011. Hot Wheels Car Club - Bay County's Oldest Car Club! Bay Mustang Club - Bay County's Mustang Only Club! Outlaws Car Club - Old school club ridin' like Outlaws! Freeport Cruisers - Friendly, family club covering all makes and models! American Muscle Car Club - American muscle is what it is all about! Emerald Coast Corvette Club - Corvettes and nothing but Corvettes! Florida Mopars - High quality, finely-tuned Mopar machines! Vital Signs Street Designs - Celebrating 22 years strong in the car & truck scene! NFSPmotorsports - Experienced tuners with stylish Imports! Bay British Car Club - Representing British styling with class! Lotus Car Club, LTD - North America's Largest Lotus Club! Christian Rods & Customs - We love Christ & Cars! Renegade Car Club - Cool cars representing all makes & models. Southern Customs - Build 'em, Big, and Build 'em Badd! Deep South Mopars - Florida Panhandle Mopar Enthusiast Club! Panama City LSX - GM Performance People! Sideshow Car Club - Kingston & Opp, Alabama - Custom vehicle fabricators! NSRA - Street Rods is where it's at! Race 850 - Racing is our passion. Presidents Bike Club - Stunning works' of art on wheels! Darkside Kustoms - Seriously Built Show Machines! SSC - Shelby Super Cars! Many, many high quality, vehicles and people from all over the Southeast United States. THANK YOU SO VERY MUCH!! Like us on Facebook? Shift gears into fall with Tricked Out Car Club! When everyone else is slowing it down and ending the busy summer season on Panama City Beach, TOCC is cranking it up to maximum velocity with a well-planned, professional car, truck & motorcycle show. Our 4th Annual End of Summer ShowOff is designed to show the whole family a wonderful time and to give you, the community of auto enthusiasts, an event to remember! For 2011, we will have the nitrous kickin' with inside activities, and more food & drinks, more auto prizes, more GlowOff, more raffles, and more classes!! EOSS 2010 taught us many things as a club, and we are on course to bring something epic to Bay County in 2011! 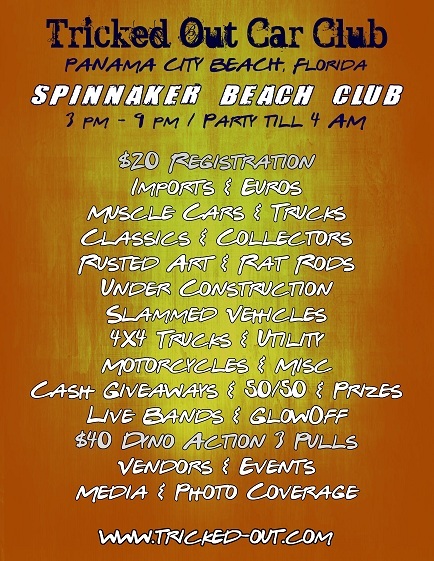 There will be door prizes, participants' prizes, and over 100 trophies geared to imports, domestics, euros, classics, luxury, exotics, hot rods, race cars, blown babies, under construction, 'stangs, 'vettes, specialty vehicles, trucks (hi & low), motorcycles and just about anything on wheels! 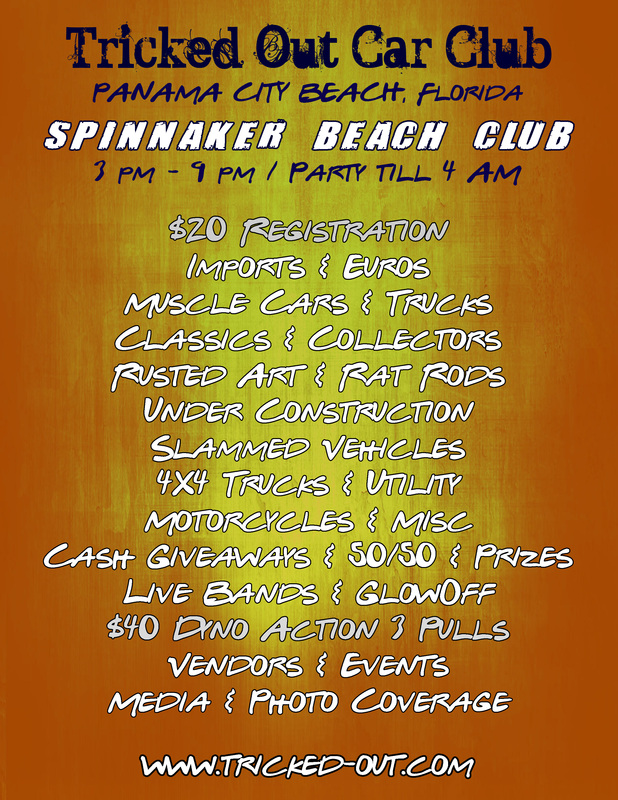 We're also adding a few fun ones too, and will continue to expand these classes by each year's participant's attendance...so come on out and build this annual, fall automotive event happening on Panama City Beach (4th Saturday in September). Spinnaker is open for all our guests, both young and old, all day and night with live music, tasty food & tall drinks. If you haven't been to Spinnaker during our EOSS event (till 9:00pm), it is family friendly and perfect to explore. You have the World's Most Beautiful Beaches right out back, plus a cool dance floor and sitting areas to eat, relax, and visit with friends. Or head outside to the waterfall and stage for the amazing gulf breeze rollin' up on the decks while the band plays along! Does the party stop at 9pm? Absolutely not! The Dyno will be running up till winding down about then but the the EOSS Afterparty will be running on nitrous till 4am inside Spinnaker with live music late into the night! Stay as late as you want! Proceeds will go to Anchorage Children's Home (roughly 80%), Friends of Sims Veteran Home (roughly 10%) and other local charities (see our TOCC Giveback Page). Simply by entering your vehicle in this fun, fast-paced show, you have made a difference! This is a rain or shine event. The show will go on regardless! FREE ENTRY TO THE PUBLIC. Sit on the back deck and listen to live music. Eat, enjoy the cool cars and friendly people from the auto community. $20.00 donation to Register/Show Vehicle (Bike/Car/Truck/Any) , pay at the gate. Pre-Registration is Closed. We will be accepting vehicles from 3:00 - 5:00 pm on Saturday. Registration: 2:30 - 5:00 pm $20.00. Show Opens at 3:00 pm, come inside or hang outside. Eat, drink, dance, vote, show off your ride and enjoy the show. DJ Josh, Live Music, Award-Winning Food, Chilled Drinks, Contests, Door Prizes, Raffles, GlowOff, Goodie Bags and much more! EOSS GlowOff will run from 7:15 - 8:00 pm. (All show vehicles that have LED/Neon/Extra Lighting will be entered into the EOSS GlowOFF contest. Take a break, head inside to the A/C and order up some truly fantastic food and drinks anytime, all day and all night long! Food & Drinks: Spinnaker Beach Club serves up a full menu of award-winning food of nearly every flavor. From seafood to burgers to tacos, they have it and all of your cold drinks too. If you cannot find something there, Dominos Pizza will be on the scene with $2 Pizza Slices, with half that going to Anchorage Children's Home! And we will have the facility of Oakland Terrace Elementary selling pop corn and cotton candy for those looking for something sweet & light. EOSS Afterburner: the band will take the stage at 9:30 pm, and the party races forward till 4:00 am! Party like a RockStar: 10:00 - 4:00 am with live music, dancing and partying all night long in the world's finest beach club...Spinnaker! EOSS Afterburner event is a party you will not want to miss. Award-winning food, live music, dancing, and the EOSS professional, community-driven, judged car show, with over 30 classes and 80 awards. All proceeds will go to several local charities benefitting children, military veterans, first responders and animals through our TOCC Giveback Program. We look forward to seeing our old friends...and meeting some new ones as well! Please consider attending and helping us reach our goals. 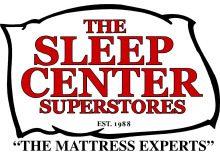 Please take a look at the fine businesses that wanted to make a difference for the children and veterans of Bay County, Florida. We are very thankful for the care and cannot express it enough. Caring for our community as friends & neighbors. By them providing the majority of funding for this event, it allows nearly every penny of the money raised to be given directly to our charity benefactors. This is a winning formula that needs your help to suceed. No one at TOCC gets paid, no one gains from this event (except for good times) and TOCC as a club does not gain a penny either. EOSS 2011 expenses are covered, with the balance turned over to the charities in our TOCC Giveback Program. It is that simple! Panama City Auto Repair - From race to repairs - the only auto shop you need! Sparkles Detail - Croftgate Products Distributor and car care experts! Eddie's Auto Body - Artists and true professionals! Dyno-on-the-Go - The East Coast Dyno Professionals! Eye Poppin' Entertainment, Inc. - Southeast's finest promotions company providing eye poppin' events for all to enjoy! Mobile Solutions - Bama & Ruth are audiophiles that love bass. Custom Ride Effects - Talent & Creativity to make your ride stand out! myCamera2Canvas - Printed Art, Photos on canvas, Automotive Braggin' Boards, and so much more! Panama City Beach Fire Department - Providing you the highest level of protection! Gulf Power - A Southern Company! Mike Reiter & Associates - Debtor's Defense. Defend lawsuits, or recover and rebuild with a fresh start through bankruptcy. Pep Boys - Your parts store and more! Knology - North Florida's communication's experts. Phone, internet and cable is all ready for you! Club Lavela - World's Largest Night Club! Vision Bank - Your Community Bank! Thank you for your continued support of Tricked Out Car Club from all the members, officers and supporters of this community automotive event. It is put on by the efforts of many, all non-paid helpers as no one in TOCC gets paid a penny, no one - it is all given to better our local community... following the core values & principles of TOCC.